MakerPlot is all about "making", so it follows that we show you how to build your own interface. The Maker Video series is dedicated to this goal. In this video you are shown how to resize the plot area, change the background color and prepare the interface for meters and switches. 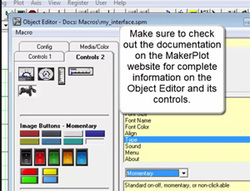 This video series is where you learn how to "make" your own GUI interfaces. Meters are vital to displaying analog and digital data, as well as setting alarms to indicate when conditions are above or below your setpoints. 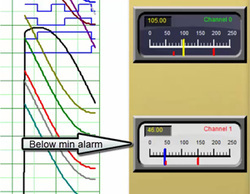 This video shows you how to add two horizontal meters to your new interface and, also, how to incorporate alarms. 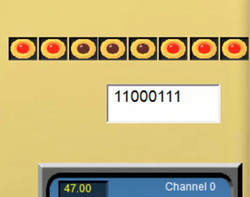 In this video we add buttons and switches to control the meter's scale and alarm functions. You're shown how to place and size the buttons and switches and then add Event Code to make them control the meter's functions. Digital data are easily shown using LEDs and MakerPlot offers you LEDs that you can place on the interface to display the individual digital bits. 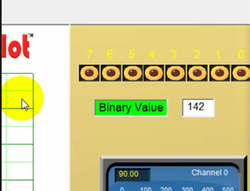 Then we show you how to add a text box to display the digital value...both in binary (shown here) and also in decimal form. It would be confusing if you didn't know which LED represented which digital bit, so MakerPlot gives you many choices for placing labels above and below the controls of interest. In this video you're shown how to place a label and duplicate it to make similar labels quickly and easily. Then we show you how to add text to the labels to identify your controls. To make all the controls come together and work MakerPlot uses Event Codes that work behind the scenes of the buttons, switches and labels to make them do what you want them to do. This video goes into Event Codes are made up of MakerPlot commands that activate the controls and, also, link controls together. Event Codes are at the heart of MakerPlot so this is a "must see" video to get you started in understanding them. 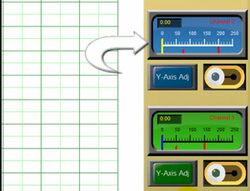 The Object Editor allows you to select and place objects like meters, switches, labels, text boxes, etc. 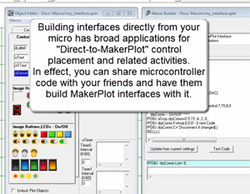 on the MakerPlot interface. 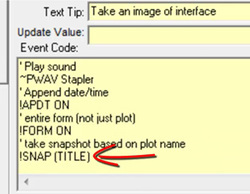 Part 1 introduces you to the structure of the MakerPlot objects and how you can place and edit them on your interface. Part 2 of the Object Editor video shows you all of the Controls 1 and Controls 2 objects in some detail and how you can enter Event Codes to make them work. 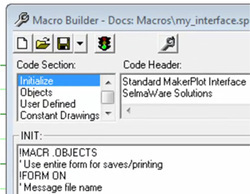 The Macro Builder takes up where the Object Editor leaves off. It's function is to configure all the objects that are created by the Object Editor...and other sources...into coherent lists of code sections that define how a MakerPlot macro is to be built. 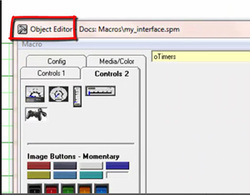 In this video we show you how to use the Object Editor and the Macro Builder to define where to place objects directly from your micro. With MakerPlot your micro is able to create objects directly on the interface area of your PC using serial data from your micro.